Two agents have claimed they made illegal payments to secure transfer deals with a former candidate for the England football manager's job. In an undercover BBC Panorama film, agent Teni Yerima says he bribed Bolton manager Sam Allardyce. Agent Peter Harrison says he paid Mr Allardyce's son to secure deals with Bolton and Craig Allardyce is filmed boasting about access to his father. 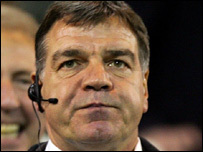 Sam Allardyce told the BBC he has never taken or asked for or received a bung. He said he would not condone any breach of FA rules whatever personal affection he has for his son. Mr Allardyce was named as a possible replacement for the England manager Sven Goran Eriksson before the job was given to Steve McClaren. Panorama also uncovered that three different Bolton transfer signings involved secret payments from agents to Craig Allardyce, some when he was contractually banned from doing any Bolton deals. The club has admitted it knew nothing about the manager's son getting a cut of the money in these deals. In the secret filming Craig Allardyce told the undercover reporter: "I'll get the (player) profile and I'll walk straight into the office and sit down with me Dad. It's easy, it's easy." Craig Allardyce told the BBC that he had exaggerated his own importance to the undercover reporter in order to attract opportunities. He denied any wrongdoing in his Bolton deals or relationship with the club. The Portsmouth manager, Harry Redknapp, is secretly filmed discussing the possibility of buying the Blackburn captain Andy Todd, illegal under FA rules. At the meeting, Mr Redknapp tells agent Peter Harrison: "I like Toddy, don't I? No I'd take him. I would take him. I would take him without a doubt." 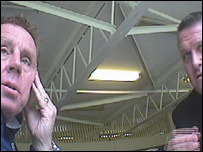 But Mr Redknapp denies his conversation about Andy Todd with the agent Peter Harrison amounted to "tapping up". His assistant at Portsmouth at the time of the filming, Kevin Bond, is secretly recorded admitting he would consider discussing receiving payments from a proposed new agency involving Peter Harrison. Bond also says he will discuss it with his then boss Harry Redknapp. Mr Redknapp told the BBC that he has never taken a bung and had given Kevin Bond no reason to think otherwise. When Mr Bond was told of the filming he said that he is not interested in receiving bungs and that no one he has ever worked with has taken a bung. The documentary also shows Chelsea's director of youth football, Frank Arnesen, secretly filmed making a illegal approach or "tapping up" Middlesbrough's England youth star 15-year-old Nathan Porritt. Last year, Chelsea were fined £500,000 by Premiership bosses, the Premier League, for "tapping up" Ashley Cole from rivals Arsenal. Chelsea have been warned they would be docked three Premiership points if they were ever caught at it again. Middlesbrough have confirmed that they did not give permission for the approach. Chelsea have denied that the filmed meeting broke any industry rules. In the programme, for the first time a former agent gives an on-camera interview about the corruption he says he has witnessed. Steven Noel-Hill said: "The game is corrupt. Bungs were the lubricant of deals. I would say that 80% of all deals have bungs attached to them." 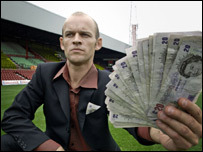 Three different licensed agents who are secretly filmed admit it is normal for some Premiership managers to take bungs. Charles Collymore - named publicly for the first time in the Panorama film by Luton Town manager Mike Newell as the agent who offered him an illegal payment - said to the undercover reporter: "There's managers out there who take bungs all day long. "I would say to you comfortably there's six to eight managers we could definitely approach and they'd be up for this no problem." When Mr Collymore was offered a right to reply to the filming he denied offering or accepting any bungs and says he gave the undercover reporter, UEFA-licensed coach Knut auf dem Berge, false information because he was suspicious of his agenda. Panorama also reveals that the Bolton chairman Phil Gartside - who is part of the Football Association board which helps police the game - misled his own fans. He complained in the press last August about an illegal approach to buy his captain Jay Jay Okocha and said he had asked Fifa to investigate. But Panorama finds out that eight days earlier he had been in a room with the agent Teni Yerima trying to sell Okocha. Mr Gartside has since told the BBC that he had not wanted to sell Okocha but could not ignore a generous offer for his player. Agent Peter Harrison has since denied that he is a corrupt agent and says that everything he said to the BBC's undercover reporter, Knut auf dem Berge, was merely pub gossip and banter. He says his payments to Craig Allardyce were legitimate. Agent Teni Yerima told the BBC that he made everything up as part of a plan to find out who Knut auf dem Berge was working for. In March, Lord Stevens, the former Metropolitan Police Commissioner, was appointed as head of a probe into alleged transfer bungs in the Premier League. He is looking at irregular payments in transfer deals made since 1 January 2004 and he is expected to publish his findings within weeks.